To Cite: Omidi Khaniabadi Y, Basiri H, Jafari A, Saeedi S, Goudarzi G, et al. Removal of Methylene Blue from Aqueous Solution by Activated Carbon from Aloe Vera Wastes, Jundishapur J Health Sci. 2018 ; In Press(In Press):e38242. doi: 10.17795/jjhs-38242. Background: Many organic and inorganic pollutants are discharged by various industries into the water bodies. One of the most important pollutants is dye materials that have adverse effects on human health. Objectives: In this study, Aloe Vera wastes-based activated carbon (AV-AC) was used as a low-cost sorbent for the removal of methylene blue (MB) as a textile dye from liquid medium. Methods: The effect of different parameters such as contact time, pH, adsorbent dosage, and initial dye concentration was investigated on the sorption of MB. The experimental data were examined by various kinetic and isotherm models. Results: The equilibrium was obtained at contact time of 40 minutes. Fitting the experimental data to different kinetics and isotherms models indicated that the experimental data were well fitted by the pseudo-second-order kinetic and Freundlich isotherm models. Conclusions: The maximum adsorption capacity was 129.87 mg/g. Due to low cost and high uptake capacity, Aloe Vera wastes can be considered as one effective sorbent for removal of MB. Water pollution due to discharging of colored wastewaters from the textile industries is an important environmental problem, especially in developing countries. Discharging these colored wastewaters into water bodies can cause adverse effects on aquatic life as well as human health. Most dyestuff components have toxic, carcinogenic and mutagenic properties (1, 2). Therefore, decolonization of these dyes are essential before their discharge into water bodies (3, 4). The treatment of the colored wastewater is very difficult, due to dyes recalcitrant organic molecules, resistance to biological degradation, and stability to heat and oxidizing agents (3). Dyes can be categorized to anionic, cationic and non-ionic dyes (5). Methylene Blue (MB) or basic blue 9 is one of the commonly cationic dyes used for various purposes in industries especially in the textile industry. Methylene Blue can cause harmful impacts on animals and humans. Several physical, chemical and microbial methods, such as membrane technologies, coagulation-flocculation, chemical oxidation, advanced oxidation, biological degradation, electrochemical techniques and adsorption, have been developed for removal of the dye from wastewaters. Among these treatment methods, adsorption process owing to its high efficiency and non-toxicity has been widely applied for the removal of dye containing wastewaters (6, 7). Activated carbon due to simplicity, high surface area, and high sorption capacity has been used as a common adsorbent to remove dye pollutants, but it is expensive and inflexible to regenerate (3, 8). Jawad et al. used activated carbon developed from biomass and reported that it is an effective and low-cost adsorbent for the removal of MB from aqueous solution (9). In another study by Rahman et al., the sorption of MB was studied by activated carbon from rice husk and it was concluded that activated carbon of rice husk can be employed as a low-cost adsorbent for the treatment of dyeing water (10). Valliammai et al. illustrated that activated carbon from Vigna mungo can be used as a potential low-cost adsorbent for MB dye removal from aqueous solution (11). In addition to activated carbon, other adsorbents such as montmorillonite nanocomposite (12), montmorillonite (4), spent tea (13), Moroccan clay (1), regenerated clay (14), diatomite (15), chitosan hydrogel (16), durian leaf powder (17), neem sawdust (18), and fly ash (19) have been employed for this purpose. Nowadays, more attention is paid to the use of low-cost sorbents for the removal of dye from aqueous solutions. Aloe Vera is a local plant that in addition to Iran, grows in other areas such as the United State, India, Australia, Africa, Mexico and South America (20, 21). The Aloe Vera leaves wastes are by-products of agricultural industries that were used for the creation latex and drug substances (20, 21). In this work, activated carbon was prepared from Aloe Vera wastes and used as a low-cost sorbent for the removal of methylene blue from synthesized wastewater. The influences of various parameters such as contact time, pH, sorbent dosage, and initial concentration of pollutants on adsorption were evaluated. In this study, Aloe Vera wastes were collected from suburban farms of Ahvaz (Khuzestan, Iran). Chemical substances including methylene blue, sulfuric acid and sodium hydroxide were purchased from Merck Co (Germany). Figure 1 shows the characteristics and chemical structure of MB. The pH of the solution was adjusted with diluted and concentrated sulfuric acid and sodium hydroxide solutions using a digital pH-meter (50-pp-sartorious model). The other chemicals used in this study were analytical-grade reagents. The stock solution of 1000 mg/L MB was prepared and the working concentrations were obtained with dilution of the stock solution. The solutions of the adsorbent and adsorbate were mixed using an orbital shaker (Behdad-Rotomix model, Iran) at 150 rpm. After separation of the gel of Aloe Vera wastes, the remaining wastes were carefully washed with deionized water to remove impurities and surface adhered particles and then were dried in an electrical oven until constant weight at 150°C for 24 hours. The dried wastes were crushed by a laboratory mill to obtain a particle size in the range of 300 to 600 µm. Besides, particles were carbonized in a furnace at 550°C for 20 minutes. Finally, activated carbon was dried in an electrical oven at 105°C for 12 hours and was crushed and sieved to obtain a uniform particle size of 40-mesh for sorption experiments. The surface morphology of activated carbon before and after the sorption process was characterized under a vacuum of a scanning electron microscope (SEM, Jeol Model Jsm-T330). Elemental analysis of Aloe Vera wastes-based activated carbon (AV-AC) was performed using a Heraeus elemental analyzer (Jobin-Yvon Ultima ICP-AES). The concentrations of MB in the solution phases were determined by a UV-Vis spectrophotometer (PG Instrument Limited Model, UK) at maximum wavelengths of 665 nm. The pH at the zero point charge (pHzcp) for the activated carbon synthesized from Aloe Vera wastes was determined by preparation of 50 mL of 0.01 M NaCl solution in a series of 100-mL Erlenmeyer flasks. The initial pH values of the NaCl solution were adjusted, as initial pH (pHi), between 2 to 12 by adding H2SO4 (0.1 M) or NaOH (0.1 M) solution. Then, sufficient amounts of adsorbent were poured into each flask and the suspensions were mixed by a mechanical shaker for 24 hours at 200 rpm. After this period, the solutions pH was measured as final pH (pHf). The pHzcp was determined by plotting the difference between pHf and pHi values (pHzcp = pHf - pHi) versus pHi (21). The contacting local of the resulting curve with abscissa given the pHzcp, the point at which pH is equal to zero (22). The batch sorption system was applied to identify the influence of different parameters including contact time (0 - 80 minutes), pH (2 - 12), adsorbent dosage (1 - 10 g/L), and initial content of pollutants (30 - 110 mg/L) on the sorption of MB by AV-AC from synthesized wastewater. All of the adsorption experiments were carried out at room temperature (25°C) and agitated at 200 rpm with 100 mL pollutant solution in a 250 mL Erlenmeyer flask. After the adsorption process, the mixture of adsorbate and AV-AC was filtered using a fiberglass paper. The sorption experiments were carried out in duplicates and the average amounts were considered. The uptake capacity and percentage of MB was computed by Equations 1 and 2. Where qe (mg/g) is the equilibrium uptake capacity per gram AV-AC. The parameters of C0 and Ce (mg/L) are the initial and equilibrium concentrations, respectively (19). Also, V (L) is the volume of the solution and m (g) is the adsorbent mass (21). Figure 2A - 2B are show the surface morphology of the sorbent before and after the MB sorption from liquid effluent. As indicated, the original activated carbon has cavities that are more irregular, have fine open pores, uneven structure and a relatively uniform pore size distribution. The effect of different contact time on the sorption capacity of MB is presented in Figure 3A. It is obvious that the adsorption capacity (qe) of MB was quickly increased over the first 40 minutes and then slowly reached a stable state at 80 minutes. The sorption capacity of MB in equilibrium time was obtained at 19.89 mg/g. Therefore, 40 minutes was selected as the optimum contact time for the subsequent experiments. Where K2 (g/mg. min, the rate constant of the pseudo-second-order model) and qe were acquired from the intercept and gradient of t/qt against t, respectively (13). Figure 3B and Table 1 show the plot of pseudo-second-order kinetic and quantities of kinetic parameters of MB adsorption by adsorbent, respectively. As indicated, the pseudo-first-order kinetic model has a correlation coefficient (R2 > 0.85) value of lower than of the pseudo-second-order kinetic model (R2 > 0.98). Thus, the sorption process of MB dye by AV-AC followed the pseudo-second-order kinetic model. The influence of solution pH on the sorption capacity of MB onto AV-AC surface was investigated over the pH range of 2 to 12. The maximum sorption rate occurred at pH of 12 equal to 22.98 mg/g. Thus, it appears that the sorption process is dependent on the pH of the solution. Methylene Blue produces molecular cations in aqueous. Figure 4B shows the pHpzc of the Aloe Vera wastes-based activated carbon. As it is obvious, the pHpzc of adsorbent was found to be equal to 11.3. Figure 4. A, Effect of pH on sorption capacity (contact time = 40 minutes, dye concentration = 50 mg/L, and adsorbent dosage = 2g/L) and B, pHpzc of adsorbent. The effect of adsorbent dosages (1 - 10 g/L) on the sorption capacity of MB was investigated at an initial concentration of 50 mg/L at pH of 12 and the results are presented in Figure 5A. As shown, with increase in the sorbent dosage from 1 to 10 g/L, the uptake capacity was reduced. Thus, dose of 1 g/L was chosen as the optimum dosage for the next stages of the experiments. The effect of various initial concentrations of MB (30 - 110 mg/L) was investigated on the sorption capacity during contact time of 40 minutes, adsorbent dosage of 1 g/L, and pH of 12 at room temperature (25°C) and the results are presented in Figure 5B. As shown, with increasing the initial concentration of pollutant from 30 to 110 mg/L, the sorbent capacity of MB onto the sorbent was gradually increased. Figure 5. . A, Effect of adsorbent dosage on sorption capacity (contact time = 40 minutes, dye concentration = 50, and pH = 12) and B, effect of initial dye concentration on Sorption (contact time = 50 minutes, adsorbent dosage = 1 g/L, and pH = 12). Where; C0 is the maximum initial MB concentration. The value of separation factor (RL) shows the adsorption condition as unfavorable (RL more than 1), liner (RL equals to1), irreversible (RL equals to 0) and favorable (RL between 0 and 1). Based on the value of RL in this study (RL = 0.58), the adsorption process of MB using AV-AC was favorable (20, 21). The Freundlich isotherm is often expressed for multilayer sorption onto a heterogeneous surface of adsorbent (1, 28). This isotherm is illustrated by Equation 7. Where Kf (l/g) and n are the rate constants of Freundlich and depict the capability and strength of the sorption process, respectively. As illustrated in Figure 6B, Kf and n were achieved using the cut off and gradient of plotting ln qe versus ln Ce, respectively (29). The n value of more than one confirms that the adsorption bonds between MB and AV-AC are appropriately strong. Table 2 corresponds with the calculated values of isotherms parameters of MB sorption by AV-AC. As indicated, the value of n computed by Freundlich model was 1.56. Furthermore, the Freundlich isotherm demonstrated a higher R2 value than Langmuir isotherm. Therefore, it was shown that the experimental sorption data of MB onto the AV-AC was best fitted by the Freundlich isotherm model. The maximum uptake capacity of MB dye by AV-AC in the present study was 129.87 mg/g. This value has been compared via Qm obtained from other studies (Table 3). It can be concluded from Table 3 that AV-AC can be considered as a very effective adsorbent for the removal of MB from aqueous solution. In this work, Aloe Vera wastes-based activated carbon (AV-AC) as an inexpensive adsorbent was used for the removal of Methylene Blue (MB) from aqueous solutions. The development of pores in Figure 2B is due to the sorption of MB molecules that filled up pores of the sorbent surface and increased the surface area of the AV-AC. Chemical composition analysis of AV-AC showed that the main elements included O, Ca, K and Mg (92.7% of the total weight (wt. %)). Other minor elements were Na (5.92%) and Cl (1.35%) (20, 21). The fast adsorption at initial contact time can be attributed to the accessibility of large numbers of the unfilled sites on the sorbent surface at the early step of the adsorption process and the adsorption sites were gradually occupied by the pollutant molecules as the contact time was increased (35, 36). This finding is consistent with the results of Hussin et al. for the removal of MB by durian leaf powder (17). Jourvand et al. reported that the equilibrium time was obtained in contact time of 60 minutes for removal of MB by HDTMA-Mt from aqueous solutions (4). Kazembigi et al. also presented that the uptake capacity for removal of MB by modified-RH was equal to 9.66 mg/g in an equilibrium time of 90 minutes (5). In another study, Utomo et al. obtained the equilibrium time of MB removal system by modified sugarcane bagasse equal to 30 minutes (37). The pseudo-second-kinetic model was fitted by the results of the present study. Similar kinetic results were expressed for the uptake of MB onto other adsorbents such as HDTMA-Mt (4), modified-RH (5), fly-ash (38), durian leaf powder (17), and Scolymus hispanicus L. (39). Valliammai et al. showed that R2 value obtained for second-order-kinetic (R2 > 0.99) is greater than that of first-order-kinetic (R2 > 0.98); therefore, the second-order-kinetic is a perfect fit for the MB removal system (11). The solution pH influences the surface nature of adsorbent and the level of ionization of adsorbate (40, 41). Moreover, the sorption of adsorbate is affected by the solution pH, due to the sorption of H+ and OH- ions in the solution. The removal rate of MB was increased with increase of the solution pH from 2 to 12 due to the increase in the magnitude of the electrostatic attractions between MB and positive charge adsorption sites. The adsorption of MB on the AV-AC surface is primarily influenced by the surface charge on the adsorbent. This finding is in agreement with the results of the study of Barka et al. for the biosorption of MB. They showed that the sorption of MB is weak in acidic medium (39). Silanol groups on this surface become increasingly deprotonated as the pH of the sorption system rises, thereby increasing the number of negatively charged adsorbent sites. Reduced adsorption of MB at acidic pH reflects the presence of excess H+ ions that compete with dye cations for the sorption sites (42). Valliammai et al. illustrated that higher sorption of MB at basic medium is due to the electrostatic attraction between the negatively charged sites of the adsorbent and the positively charged dye molecules. At higher pH, negatively charged adsorbent sites increased, which enhanced the adsorption of positively charged dye cations through electrostatic forces of attraction (11). Almeida et al. reported that the removal efficiency of MB by MC at pH of about 11 was about 97.38%, whereas at lower pH the removal efficiency was increased (42). To underestand the sorption mechanism, it is required to determine the point zero charge (pHpzc) of the adsorbent (43). On the other hand, pHpzc is a very important parameter to identify the interaction of sorbent surface with adsorbates (44). It has been identified that at any pH lower that pHpzc, the surface charge is positive, whereas at pH higher than pHpzc the surface charge is negative (22). Regarding pHpzc, it can be stated that the surface of activated carbon will be de-protonated at pH values lower than 11.3. Hence, the sorption of negatively charged MB is hindered at pH values above pHpzc. The pHpzc of adsorbent was more than 7.3 in the study of Hussin et al. (17). Decrease in the sorption capacity at higher dosage of AV-AC can be due to the unavailability of the MB molecules that cannot cover all the surface active sites of the adsorbent. In other words, a large number of active sites of the sorbent surface cannot reach saturation state at higher dosages of AV-AC. Barka et al. showed that with an increase of adsorbent dosage, the uptake capacity of the MB in solution was decreased (39). The sorption capacity of AV-AC was increased with increasing of MB concentrations. This is probably due to the increase in driving force of MB molecules including Vander Waal's force to the surface active sites of the adsorbent that occurs at higher concentrations of adsorbate. The experimental data of MB by AV-AC were well fitted by Freundlich isotherm model. Similar results were presented for the sorption of MB by several adsorbent such as ash of walnut shell (45), HDTMA-Mt (4) and modified-RH (5). The results of the study of Kazembigi et al. (2014) showed that the uptake of MB by rice husk was well fitted by the Freundlich isotherm model (5), which is consistent with the results of our study. Chang et al. (12) indicated that the adsorption data of MB using montmorillonite followed by Freundlich isotherm (R2 > 0.99) than that of Langmuir (R2 > 0.98) and Tempkin (R2 > 0.93) isotherm models. The effect of various parameters such as contact time, pH, adsorbent dosage, and initial dye concentration was assessed on sorption. The optimum contact time in the sorption process was achieved after 40 minutes. Furthermore, the optimum pH was also obtained at pH 12. The experimental data were well fitted by pseudo-second-order kinetic and Freundlich isotherm models. The maximum monolayer adsorption capacity of MB was 129.87. The results illustrated that AV-AC as a low cost, eco-friendly, non-toxicity, and high capacity sorbent towards other sorbents can be used as an effective material for the removal of MB from aqueous solution. Authors’ Contribution: The manuscript was writen by Yusef Omidi, and other authors were involved in other tasks of the research. 1. Elmoubarki R, Mahjoubi FZ, Tounsadi H, Moustadraf J, Abdennouri M, Zouhri A, et al. Adsorption of textile dyes on raw and decanted Moroccan clays: Kinetics, equilibrium and thermodynamics. Water Resource Indust. 2015;9:16-29. 2. Cheng Z, Zhang L, Guo X, Jiang X, Li T. Adsorption behavior of direct red 80 and congo red onto activated carbon/surfactant: process optimization, kinetics and equilibrium. Spectrochim Acta A Mol Biomol Spectrosc. 2015;137:1126-43. doi: 10.1016/j.saa.2014.08.138. [PubMed: 25305604]. 3. Liu Q, Yang B, Zhang L, Huang R. Adsorption of an anionic azo dye by cross-linked chitosan/bentonite composite. Int J Biol Macromol. 2015;72:1129-35. doi: 10.1016/j.ijbiomac.2014.10.008. [PubMed: 25453286]. 4. Jourvand H, Shams Khorramabadi G, Omidi-Khaniabai Y, Godini H, Nourmoradi H. Removal of methylene blue from aqueous solutions using modified clay. J Basic Res Med Sci. 2015. 5. Kazembigi F, Soheil Arezoomand H, Faraji H, Mazloomi S, Mohammadi Moghadam F, Nourmoradi H. Removal of methylene blue from aqueous solutions using raw and modified rice husk. Veliger. 2014;53:1-7. 6. Dawood S, Sen TK. Review on dye removal from its aqueous solution into alternative cost effective and non-conventional adsorbents. J Chem Process Eng. 2013;1(1):1. 7. Chen D, Chen J, Luan X, Ji H, Xia Z. Characterization of anion–cationic surfactants modified montmorillonite and its application for the removal of methyl orange. Chem Eng J. 2011;171(3):1150-8. 8. Gupta V, Agarwal A, Singh MK. Belpatra (aegel marmelos) bark powder as an adsorbent for the color removal of textile dye torque blue. Int J Sci Eng Technol. 2015;4(2). 9. Jawad AH, Rashid R, Ishak M, Wilson LD. Adsorption of methylene blue onto activated carbon developed from biomass waste by H2SO4 activation: kinetic, equilibrium and thermodynamic studies. Desalination Water Treat. 2016:1-13. 10. Rahman M, Amin S, Alam A. Removal of methylene blue from waste water using activated carbon prepared from rice husk. Dhaka Unive J Sci. 2012;60(2):185-9. 11. Valliammai S, Subbareddy Y, Nagaraja K, Jeyaraj B. 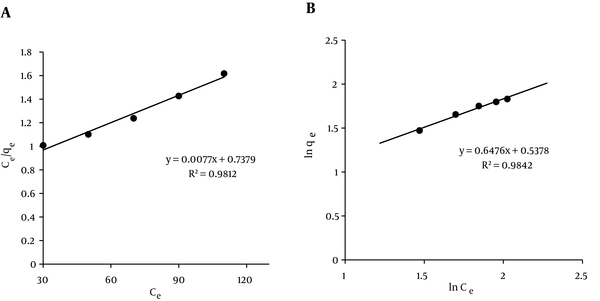 Removal of methylene blue from aqueous solution by activated carbon of Vigna mungo L and Paspalum scrobiculatum -Equilibrium, kinetics and thermodynamic studies. J Chem Pharmaceut Res. 2016;8(1):595-606. 12. Chang J, Ma J, Ma Q, Zhang D, Qiao N, Hu M, et al. Adsorption of methylene blue onto Fe 3 O 4/activated montmorillonite nanocomposite. App Clay Sci. 2016;119:132-40. 13. Babaei AA, Alaee Z, Ahmadpour E, Ramazanpour-Esfahani A. Kinetic modeling of methylene blue adsorption onto acid-activated spent tea: A comparison between linear and non-linear regression analysis. J Adv Envi Health Res. 2014;2(4):197-208. 14. Meziti C, Boukerroui A. Removal of a basic textile dye from aqueous solution by adsorption on regenerated clay. Procedia Engin. 2012;33:303-12. 15. Al-Ghouti MA, Khraisheh MA, Ahmad MN, Allen S. Adsorption behaviour of methylene blue onto Jordanian diatomite: a kinetic study. J Hazard Mater. 2009;165(1-3):589-98. doi: 10.1016/j.jhazmat.2008.10.018. [PubMed: 19022576]. 16. Chatterjee S, Lee MW, Woo SH. Adsorption of congo red by chitosan hydrogel beads impregnated with carbon nanotubes. Bioresour Technol. 2010;101(6):1800-6. doi: 10.1016/j.biortech.2009.10.051. [PubMed: 19962883]. 17. Hussin ZM, Talib N, Hussin NM, Hanafiah M, Khalir W. Methylene blue adsorption onto NaOH modified durian leaf powder: isotherm and kinetic studies. Am J Env Eng. 2015;5(3A):38-43. 18. Khattri SD, Singh MK. Removal of malachite green from dye wastewater using neem sawdust by adsorption. J Hazard Mater. 2009;167(1-3):1089-94. doi: 10.1016/j.jhazmat.2009.01.101. [PubMed: 19268452]. 19. Wang S, Boyjoo Y, Choueib A, Zhu ZH. Removal of dyes from aqueous solution using fly ash and red mud. Water Res. 2005;39(1):129-38. doi: 10.1016/j.watres.2004.09.011. [PubMed: 15607172]. 20. Basiri H, Nourmoradi H, Moghadam F, Moghadam K, Mohammadian J, Khaniabadi Y. Removal of aniline as a health-toxic substance from polluted water by aloe vera waste-based activated carbon. 2015;7(11):149-55. 21. Omidi-Khaniabadi Y, Jafari A, Nourmoradi H, Taheri F, Saeedi S. Adsorption of 4-chlorophenol from aqueous solution using activated carbon synthesized from aloe vera green wastes. J Adv Env Health Res. 2015;3(2):120-9. 22. Lin X, Zhang J, Luo X, Zhang C, Zhou Y. Removal of aniline using lignin grafted acrylic acid from aqueous solution. Chem Eng J. 2011;172(2):856-63. 23. Moeinpour F, Alimoradi A, Kazemi M. Efficient removal of Eriochrome black-T from aqueous solution using NiFe 2 O 4 magnetic nanoparticles. J Env Health Sci Eng. 2014;12(1):1. 24. Qiu M, Xiong S, Wang G, Xu J, Luo P, Ren S, et al. Kinetic for adsorption of dye methyl orange by the modified activated carbon from rice husk. Adv J Food Sci Technol. 2015;9(2):140-5. 25. Dong K, Qiu F, Guo X, Xu J, Yang D, He K. Adsorption behavior of azo dye eriochrome black T from aqueous solution by β-cyclodextrins/polyurethane foam material. Polymer-Plastics Technol Eng. 2013;52(5):452-60. 26. Silva M, Oliveira MM, Avelino MC, Fonseca MG, Almeida RK, Silva Filho EC. Adsorption of an industrial anionic dye by modified-KSF-montmorillonite: Evaluation of the kinetic, thermodynamic and equilibrium data. Chem Eng J. 2012;203:259-68. 27. Kadhim LH. Granite as an adsorption surface for the removal of bromo phenol red, bromo cresol green and leishman's stain from aqueous solutions. J Basrah Res. 2012;38(3). 28. Monsalvo VM, Mohedano AF, Rodriguez JJ. Activated carbons from sewage sludge: application to aqueous-phase adsorption of 4-chlorophenol. Desalination. 2011;277(1):377-82. 29. Xiao S, Wang Z, Ma H, Yang H, Xu W. Effective removal of dyes from aqueous solution using ultrafine silk fibroin powder. Adv Powder Technol. 2014;25(2):574-81. 30. Khattri SD, Singh MK. Colour removal from synthetic dye wastewater using a bioadsorbent. Water, Air, Soil Pollution. 2000;120(3-4):283-94. 31. Kumar KV, Ramamurthi V, Sivanesan S. Modeling the mechanism involved during the sorption of methylene blue onto fly ash. J Colloid Interface Sci. 2005;284(1):14-21. doi: 10.1016/j.jcis.2004.09.063. [PubMed: 15752779]. 32. Kavitha D, Namasivayam C. Experimental and kinetic studies on methylene blue adsorption by coir pith carbon. Bioresour Technol. 2007;98(1):14-21. doi: 10.1016/j.biortech.2005.12.008. [PubMed: 16427273]. 33. Shin WS. Competitive sorption of anionic and cationic dyes onto cetylpyridinium-modified montmorillonite. J Environ Sci Health A Tox Hazard Subst Environ Eng. 2008;43(12):1459-70. doi: 10.1080/10934520802232337. [PubMed: 18780224]. 34. Jain AK, Gupta VK, Bhatnagar A, Jain S. A comparative assessment of adsorbents prepared from industrial wastes for the removal of cationic dye. J Indian Chem Soci. 2003;80(4):267-70. 35. Roshan B, Kadirvelu K, Kumar N. Investigation of aniline adsorption onto spherical carbon: optimization using response surface methodology. Int J Eng Res Appl. 2013;3(5):943-52. 36. Nourmoradi H, Avazpour M, Ghasemian N, Heidari M, Moradnejadi K, Khodarahmi F, et al. Surfactant modified montmorillonite as a low cost adsorbent for 4-chlorophenol: Equilibrium, kinetic and thermodynamic study. J Taiwan Institute Chem Eng. 2016;59:244-51. 37. Utomo H, Phoon R, Shen Z, Ng L, Lim Z. Removal of methylene blue using chemically modified sugarcane bagasse. Natur Res. 2015;6(4):209. 38. Wang S, Boyjoo Y, Choueib A. A comparative study of dye removal using fly ash treated by different methods. Chemosphere. 2005;60(10):1401-7. doi: 10.1016/j.chemosphere.2005.01.091. [PubMed: 16054909]. 39. Barka N, Abdennouri M, Makhfouk M. Removal of methylene blue and eriochrome black t from aqueous solutions by biosorption on scolymus hispanicus l.: Kinetics, equilibrium and thermodynamics. J Taiwan Institute Chem Eng. 2011;42(2):320-6. 40. Chen ZX, Jin XY, Chen Z, Megharaj M, Naidu R. Removal of methyl orange from aqueous solution using bentonite-supported nanoscale zero-valent iron. J Colloid Interface Sci. 2011;363(2):601-7. doi: 10.1016/j.jcis.2011.07.057. [PubMed: 21864843]. 41. Chaari I, Feki M, Medhioub M, Bouzid J, Fakhfakh E, Jamoussi F. Adsorption of a textile dye "Indanthrene Blue RS (C.I. Vat Blue 4)" from aqueous solutions onto smectite-rich clayey rock. J Hazard Mater. 2009;172(2-3):1623-8. doi: 10.1016/j.jhazmat.2009.08.035. [PubMed: 19733432]. 42. Almeida CA, Debacher NA, Downs AJ, Cottet L, Mello CA. Removal of methylene blue from colored effluents by adsorption on montmorillonite clay. J Colloid Interface Sci. 2009;332(1):46-53. doi: 10.1016/j.jcis.2008.12.012. [PubMed: 19150082]. 43. Wang L, Zhang J, Wang A. Removal of methylene blue from aqueous solution using chitosan-g-poly (acrylic acid)/montmorillonite superadsorbent nanocomposite. Colloids and Surfaces A: Physicochem Eng Aspects. 2008;322(1):47-53. 44. Cengiz S, Tanrikulu F, Aksu S. An alternative source of adsorbent for the removal of dyes from textile waters: Posidonia oceanica (L.). Chem Eng J. 2012;189:32-40. 45. Jafari Mansoorian H, Mahvi AH, Kord Mostafapoor F, Alizadeh M. Equilibrium and synthetic studies of methylene blue dye removal using ash of walnut shell. J Health Field. 2013;1(3):48-55.